A super little Mother’s Day family walk on to the summit of the unsung Skipton Moor enjoying some fantastic long distance views. It has become a tradition over the last couple of years to celebrate Mother’s Day by heading off towards Skipton, doing a short walk or canal trip and then heading to the wonderful Skipton Pie & Mash Shop for lunch. This year I chose to do a shortened version of a walk I’d done on to Skipton Moor in early 2015. Parking near the top of Short Bank Road we continued to the top of the street where it merges into the rougher track climbing up alongside Jenny Gill. After a muddy stretch the path looped up through the woods to briefly emerge into a more open area with Skipton already laid out below us. Continuing east the path maintained a straight course slanting ever so slightly upwards through some pleasant woodland. Emerging from the trees we came to a gate on our right where we took a clear path, not marked on the map, which climbed diagonally up to the top corner of the next plantation. Rhiannon, my daughter, shot off ahead wanting to be the first to the top only to be disappointed and temporarily disheartened when she discovered there was still some uphill work to do. Walking round one moorland bump there was another steep, if shorter, pull up to the waiting summit of Skipton Moor. For such a modest height Skipton Moor really is a great viewpoint and it was made all the more dramatic by the distant hills having a covering of snow. 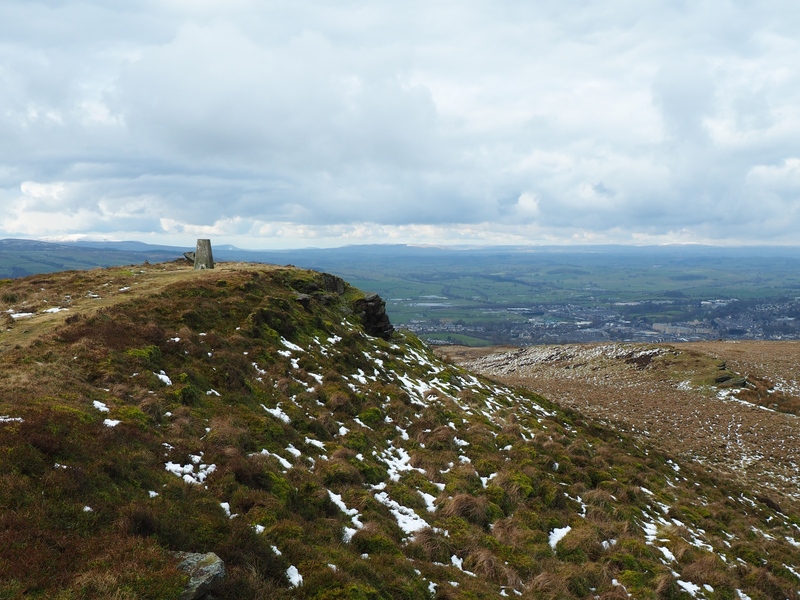 We spent sometime on the summit taking pictures of the trig point, posing on the small nearby crag and also visiting a couple of the larger cairns. Eventually we continued on by taking a thin path to Standard Crag where we turned right on a clearer path. This led us pleasantly back down to the top of Jenny Gill from where we retraced our outward steps back down to Short Bank Road. We’d had a lovely time and even Rhiannon had hardly complained which in itself was a compliment! I really enjoyed the walk?